Adventures in Orbit Video Slot Guide & Review - Casino Answers! Adventures in Orbit is a 5-reel, 25-line video slot developed by Random Logic, featuring a wild symbol, multipliers, a free spins feature and a bonus game. You can play the Adventures in Orbit video slot at Bovada. Bets on the Adventures in Orbit slot machine are $0.05, $0.10, $0.25, $0.50, $1, $2, $5 and $10 per line. You can select from 1-25 active paylines. The lowest bet you can make on the Adventures in Orbit slot game is a nickel per spin up to the maximum total bet of $250 per spin. You can select 1-99 autoplay spins. 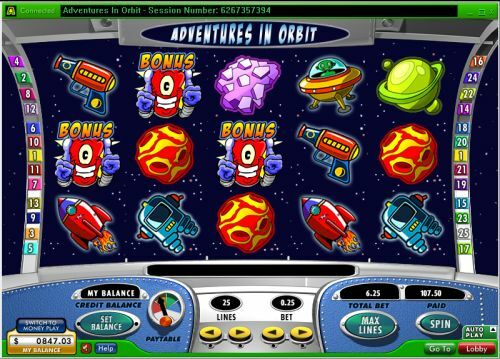 To play the Adventures in Orbit video slot with all 25 lines enabled, hit the “Max Lines” button. For any other bet, select your bet and hit the “Spin” button. The highest paying symbol on the Adventures in Orbit online slot is the Spaceship symbol. If you hit 5 Spaceship symbols on a selected payline, you will win the 10,000 coin top jackpot. The Capsule symbol is the second highest paying symbol in Adventures in Orbit. 5 Capsule symbols on a payline will pay out 2000 coins. There are two wild symbols on the Adventures in Orbit video slot. The first is the regular wild symbol. It will substitute for all symbols except for the scatter and bonus symbols. The wild symbol dos not pay by itself. The other wild symbol is the same as the regular wild symbol, except it only appears on the third reel and will act as a 2X multiplier. The scatter symbol on Adventures in Orbit is the Intergalactic Navigator symbol. If you hit 3, 4 or 5 Scattered Intergalactic Navigator symbols anywhere on the reels, you will win 10, 20 or 30 free spins. Free spins will play the same number of active lines and bet per line as the original game. All prizes, including additional free spins (which will be accumulated to the existing one, infinitely), can be won during the free spins feature. Win lots of cash with the Adventures in Orbit free spins feature at Bovada! All symbols pay left to right on consecutive reels of an active payline, except the scatter symbol. All wins are multiplied by the bet per line, except scatter wins. Scatter wins are multiplied by the total bet. Scatter and bonus wins are paid in addition to payline wins. Only the highest win is paid on each of the active paylines. The Adventures in Orbit video slot comes with a fun theme, a high top payout, a very good bonus game and a free spins feature. It is definitely one of the better Random Logic video slots we have played. We recommend you play it too when you sign up and make a deposit today at Bovada! 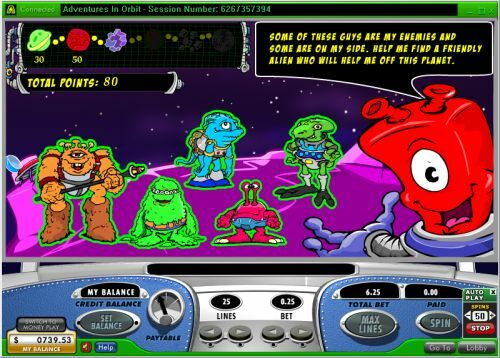 Can players from the United States play the Adventures in Orbit slot for real money? If you’re located in the United States, you can’t play the Adventures in Orbit video slot for real money but you can play the Cosmic Quest: Mission Control and Cosmic Quest: Mystery Planets iSlots at Bovada. Where can I play more sci-fi themed slot games? Aside from the two listed directly above, there are many more sci-fi, space and time travel slot games that you can play. For a complete list of them, please read our Sci-Fi Slots List.